The Royall House and Slave Quarters sits on property purchased in 1732 by Isaac Royall Senior (1672-1739). Born to parents of modest means in Maine, Royall moved with his family to Dorchester, Massachusetts, when he was three years old. He became a merchant mariner and at 28 established a sugar cane plantation on the West Indies island of Antigua. Trading in sugar, rum, and enslaved people, he amassed a great fortune. Isaac married Elizabeth Browne in 1707; only two of their several children survived into adulthood: Isaac Royall Junior (1719-1781) and Penelope (1724-1800). In 1737, Royall returned to his native New England. In anticipation of his family’s move, he had purchased “Ten Hills Farm,” a property of 500 acres in Medford, Massachusetts. On the northeastern portion of the property, near the Mystic River, stood a two-and-one-half story brick house believed to have been built around 1690. Over the course of five years, Isaac’s brother, a Boston merchant, supervised the expansion of this structure into a three-story Georgian mansion and had a carriage house, stable, “Out Kitchen,” and several barns built on the site. When the Royalls took up residence on the estate, they brought with them at least 27 enslaved Africans. 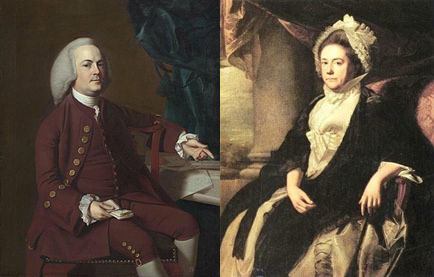 Painting of the Royall family, by Robert Feke, 1741. Following Isaac Royall Senior’s death in 1739, his son inherited the immense estate at the age of 20. One of the colony’s wealthiest men and an active real estate investor, Isaac Royall Junior held highly visible public offices and entertained lavishly. He and his wife, Elizabeth McIntosh, had two surviving daughters. Although he was apparently sympathetic to the Patriot cause, Isaac’s wealth was based on his strong ties to powerful Loyalist families and the English crown. He left Medford three days before the battle of Lexington and, failing to secure passage to Antigua, sailed to Nova Scotia where he remained for a year. He then joined his daughters’ families in England, where he died of smallpox in 1781. A bequest in Royall’s will was used by Harvard to establish its first professorship of law. Isaac Junior’s sister, Penelope, had married Henry Vassall, the son of a Jamaican planter, in 1742 and moved to Cambridge, Massachusetts with enslaved people willed to her by her father. After the outbreak of the Revolution, Penelope was able to return with her daughter and granddaughter to Antigua where she lived in greatly reduced circumstances until after the war. She then returned to Boston and died in 1800.